Markku Mylly, Managing Director of the European Maritime Safety Agency, EMSA, formerly employed by the Finnish Maritime Administration, but above all a “tanker-man” is running EMSA in Lisbon, which is the link between the member states and the European Commission when it comes to maritime regulations. 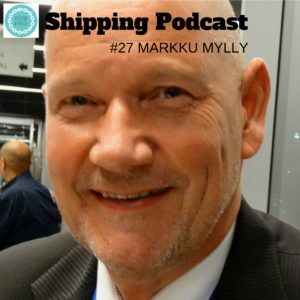 Markku is of the opinion that the shipping industry is fulfilling the SECA regulations which came into full force Jan 1st, 2015. They have recorded more than 6,000 measurements and the majority is in compliance. Every year, more than 2,800 maritime incidents and accidents within European waters are reported to EMSA. Markku thinks that the 80 serious accidents reported last year has to be reduced, every accident means environmental and economic implications, but the fatal accidents has to be brought down to a minimum. People don’t understand that Europe is totally dependent on shipping, it’s paramount that we raise the profile of shipping. Have you got the recipe for spreading the word about shipping and the Shipping Podcast in particular? It’s through sharing the fact that there is a Shipping Podcast and then writing a review. Please, feel free to put your view forward – it’s easy!